After seeing the documentary Fresh, I wanted to learn more about the life of farmers. 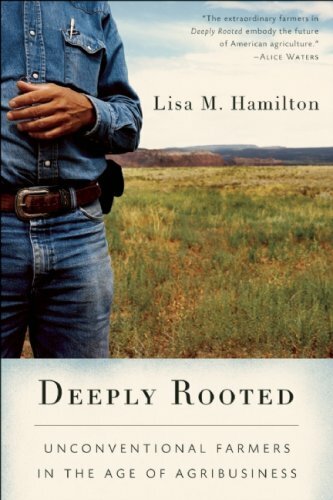 Deeply Rooted: Unconventional Farmers in the Age of Agribusiness by Lisa M. Hamilton is split into three parts. Each section profiles a different farming family and community. These are farmers that going against the trend of big agribusiness and showing more stewardship of the land. My favorite section was the final one. It went through how farmers before 1900 were responsible for breeding plant seeds themselves. They gradually handed that roll over to agribusiness. Those companies now are genetically modifying plants to maximize yields and survive herbicides. The farmer in the third section still goes through his fields collecting and breeding seeds for his future harvests. The walk away lesson I learned was that seeds have memories. Those plants that have survived past challenges (droughts, weeds) are capable of producing seeds that will overcome future challenges of the land in that region without the use of herbicides. I really liked this book. For a few days I felt like I was living in small town America riding shotgun on the farm pickup truck.